Michael and I spent the weekend a the Global Atheist Convention, our minds have been stimulated and pushed in all sorts of directions. It was simply brilliant. 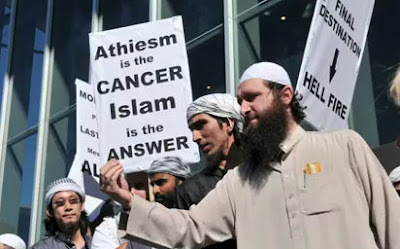 During the lunch break a small group of Islamic fundamentalist appeared to tell us that we were wrong and atheism is a cancer. The crowd responded with jeers and chants, surrounded the Muslims and engaged in a change of ideas. Security guards circled them creating a small barrier between the two groups. One woman threw herself against the protesters and was jostled away. My partner Michael and I took advantage of the moment to kiss in front of the group. We understand that in some Islamic states gay people are persecuted and executed for their sexuality. It was an ideal opportunity to challenge the notion of acceptance and tolerance. As we began kissing, the Muslims began chanting, "Burn in hell." Many more photos are in the below video slideshow.